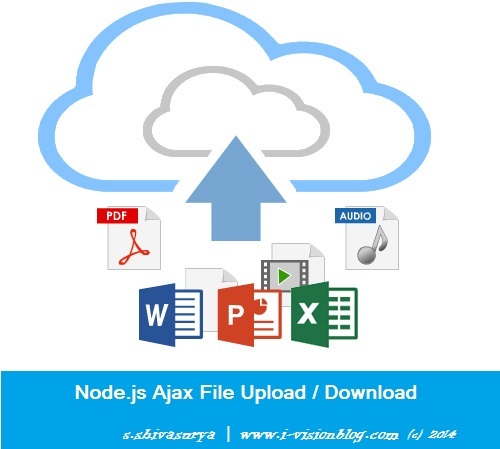 Uploading the files is important aspect of transferring the data to the server from the client and moving it to the storage to share for downloading and later usage also.However encryption is important aspect of saving the Files safely with pass phrase encryption/and Decryption on Downloading or requesting.These types of Application is done generally in Cloud for user safety for files from Illegal Access.However Node.js doesn't allows you to peep into directories and get download the files where these directories are generally private unless you make it as Public Folder.This is a Main Advantage for us. We are Just going to Upload the Files via Ajax and Retrieve Files from Directory using FS module and make to available for Download.This Application is simple integration of Storing files online and retrieving it from anywhere. Create package.json and run the installation to create dependencies for our app. Let me Explain about the server.js - i am initializing the app with Express Framework.Then setting the port for the app to listen in my Configuration function by app object of express.For Templating language i have used JADE to parse the variables across the files(view) and set up my View directory. So, creating the routes explicitly read here and here to create route url for Node.js Application.I have created four routing URL for index,Upload,Download,listing files. Replace the Path URL to fetch corresponding files from your directory.For the Convenience I have used JADE as Templating language ,You must use it carefully since it is space/tab sensitive.Use online Jade input/output for verfiying your syntax. This is a simple script that can post the filename we request and download the file from Node.js express routes /download.i am not doing any Ajax operation here.just submiting POST request to server for downloading a file. on clicking the download button,Jquery request for the file and downloads on the browser automatically. I Have tested on Localhost node.js server ,Have a try with demo files provided,If any error/Bug in Code/Article post as comment/mail me s.shivasurya@gmail.com.connect with me via Facebook/Twitter for help.Share is care.report for bugs.